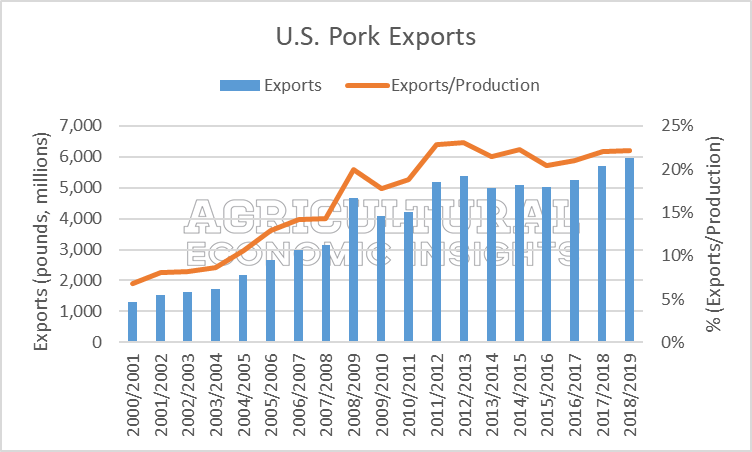 In light of the increasing uncertainty surrounding trade policy, this week’s post is a quick review of U.S. agricultural exports. U.S. trade policy has jumped to the front of everyone’s mind in recent years. From Brexit to TPP and NAFTA, trade policy has been in the global spotlight. The scrutiny has created a lot of uncertainty and unease. Most recently, the White House has floated the idea of imposing steel and aluminum tariff on imports bound for the U.S. The ripple effects of such a policy decision have unpredictable and unforeseeable implications, but concerns of a trade war, especially with China, are not unwarranted. Figure 1 shows the value of all U.S. agricultural exports from 1967 to 2017. These data are inflation-adjusted to 2017 dollars (real dollars). In recent years, corresponding with the boom in farm incomes, a sharp uptick in the value of ag exports began around 2005. Throughout most of the 1990s and early 2000s, the value agricultural exports were around $70 billion. This jump sent exports to $156 billion by 2014, and is currently at $138 billion. Previously, ag exports surged in the 1970s and collapsed in the 1980s. The sharp contraction in ag exports corresponds with the Farm Financial Crisis of the 1980s. The value of ag exports decreased 48% from the peak in 1980 to low in 1987. Most recently, the value of exports fell 12% from 2014 to 2015. It’s worth noting the value of ag exports (the data in figure 1) can change from a combination of two factors: 1) changes the quantity exported and/or 2) changes in the unit-price of goods exports. Figure 1. Real (inflation-adjusted) Value of Total U.S. Ag Exports, Billions of Dollars (2017 dollars). 1967-2017. Data Source: USDA’s FAS: GAT (Global Ag Trade) Database. Figure 2. Real (inflation-adjusted) Value of U.S. Bulk Ag Exports (grey) and U.S. Consumer Oriented Products (orange), Billions of Dollars (2017 dollars). 1967-2017. Data Source: USDA’s FAS: GAT (Global Ag Trade) Database. After trending lower from 2007 to 2014 – a combination of domestic ethanol demand and the 2012 drought- U.S. corn exports have moved higher in recent years. Corn exports for the 2016/2017 marketing year were the second highest level in 18 years. Even though corn exports are expected to be lower in the current marketing year, they are still above 2 billion bushels. Corn exports have exceeded 2 billion bushels only 5 of the last 18 years. Currently, corn exports account for 14% of production (in orange, right axis). When corn export previously exceeded 2 billion bushels, exports accounted for 19%-20% of exports. Figure 3. U.S. Corn Exports (Bushels, Millions) (In Blue, Left Axis) and Share of Production Exports Represent (In Orange, Right Axis). Data Source: USDA FAS. Mexico is the top international buyer of U.S. corn (figure 2). In 2017, Mexico accounted for 28% of total U.S. corn exports while Japan accounted for 24%. Rounding out the top-five was Columbia (9%), South Korea (8%), and Peru (6%). A common theme for agricultural exports is how significant the largest trade partners are. For corn, the 3rd, 4th, and 5th largest buyers collectively account for 23% of all exports, which is still less than Mexico and Japan individually. Collectively, the top-5 account for 74% of all U.S. corn exports. Figure 4. Top Five U.S. Corn Export Buyers, 2017. Data Source: USDA FAS, GAT database. A much different story has emerged for soybeans. Soybean exports have doubled in recent years, up from 1 billion bushels in the early 2000’s to more than 2 billion bushels in 2016 (Figure 5). The share of soybeans exported has increased from 35% to 51% in 2016/2017. For the current marketing year, soybean exports are expected to be 48% of production. Figure 5. U.S. Soybean Exports (Bushels, Millions) (In Blue, Left Axis) and Share of Production Exports Represent (In Orange, Right Axis). Data Source: USDA FAS. While most would expect China to be the largest international buyer of U.S. soybeans, the magnitude of China’s market share is significant. In 2017 China accounted for 58% of all U.S. soybean exports. The other top buyers – Mexico, the Netherlands, Indonesia, and Japan – each accounted for less than 10% of total soybean exports. Collectively, the top-5 account for 78% of all U.S. soybean exports. The concentration of soybean exports to China possess a serious potential risk in a trade-war scenario. Figure 6. Top Five U.S. Soybean Export Buyers, 2017. Data Source: USDA FAS, GAT database. Since the 2000’s the U.S. has exported around 1 billion bushels of wheat annually. This ebbs and flows, but has mostly trended around the 1 billion bushel mark. U.S. wheat exports in 2017/2018 are expected to be 55% of total production. Figure 7. U.S. Wheat Exports (Bushels, Millions) (In Blue, Left Axis) and Share of Production Exports Represent (In Orange, Right Axis). Data Source: USDA FAS. The top destination for wheat exports is Mexico, which accounts for 14% of total U.S. exports. Japan, the Philippines, Nigeria, and South Korea are also top buyers. Collectively, the top-5 account for 46% of all U.S. wheat exports. Overall, wheat has a much more diverse export market, compared to corn and soybeans. Figure 8. Top Five U.S. Wheat Export Buyers, 2017. Data Source: USDA FAS, GAT database. 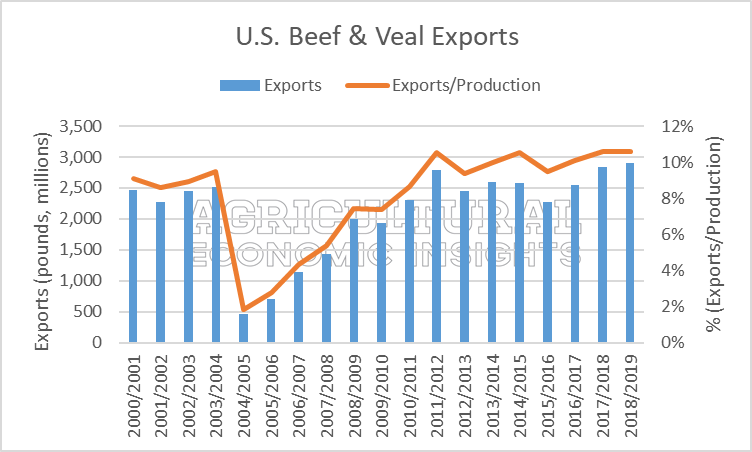 Export and trade partner data can is also available for beef (here and here) and pork (here and here). 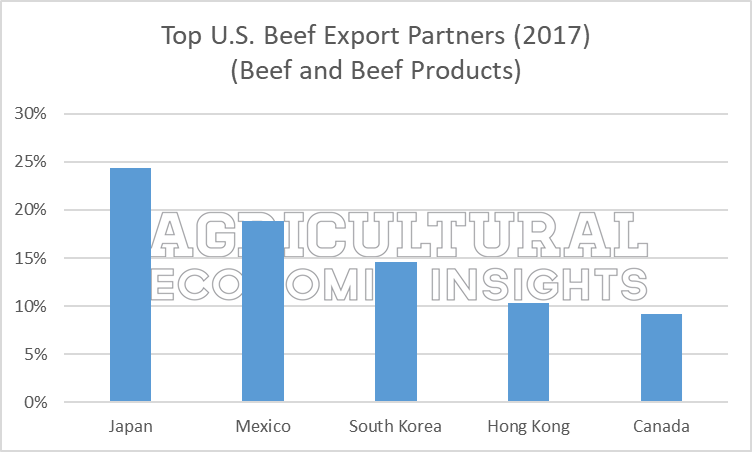 In 2017, Canada, China, and Mexico were the three largest buyers of U.S. agricultural exports (Figure 9). These three countries account for 42% of the value of all U.S. agricultural exports. These three countries accounted for less than 20% of all trade in the 1990s. Given the uncertainties around NAFTA (which is the free trade agreement between the U.S., Canada, and Mexico) the possibility of tougher trade relations with China (the talk of steel and aluminum tariffs) this chart captures the risk agriculture may face in the event of a trade war. There are two key takeaways from figure 9. First, Canada, China, and Mexico are significant buyers of U.S. agricultural exports. A souring of trade relations with these countries would be a risk for agricultural producers. Second, even as agricultural exports have grown over time (figure 1), these counties have become more significant buyers. This is to say these counties have been a significant source of the growth in U.S. ag exports. Specifically, these three counties have accounted for 54% of the increase in U.S. agricultural exports from the early 1990s. China, alone, accounted for 22% of the increase. 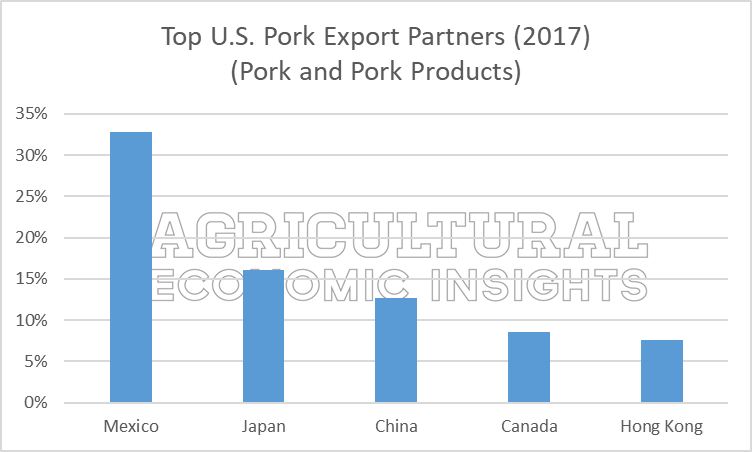 Looking ahead, the trade relations we have with these counties will likely serve as a key indicator of how U.S. ag exports – and overall demand for U.S. agricultural products- grows into the future. One more note on China; in 2017 soybeans accounted for 63% of China’s purchases of U.S. ag products. Figure 9. Share of U.S. Exports to Canada (Blue), China (orange), and Mexico (grey), 1990-2017. Data Source: USDA’s FAS: GAT (Global Ag Trade) Database. Agricultural exports are an important and growing driver of the U.S. agricultural economy. While ag exports are typically talked about in broad terms, it’s important to remember 1) exports account for a different share of production for each crop 2) the size of and concentration of trade partners varies and 3) the impact of trade with Canada, China, and Mexico today – and since the 1990s- is significant. Unraveling the impacts of a trade war are not simple (here) and even without a full-blown trade war, the proposed tariffs could be enough to make the macro-outlook unfavorable for agriculture (here). With that in mind, it’s important to remember a 10% decrease in exports would have different impacts on ending stocks and stock/use ratios. Soybeans, which relies heavily on exports and has relatively low ending stocks, would face significant headwinds from a drop in exports. All in all, increasing trade – not disrupting it- would be better for the health of the U.S. agricultural economy.